Michigan is a swing state. We’re not talking politics here. Or baseball. Or, you know, that other swinging (a tough sell in a cold river). We are talking, of course, about steelhead. The latest addition to my favorite instructional video series of all time, Skagit Master 4, showcases what makes living and fishing in the Midwest so great: lots of opportunities to rear back and sling furred and feathered nutriment to lake-resident chromers. Give it a watch (now even easier with instant streaming) and you’ll see what I mean. I recently had the chance to sit down with one of the luminaries of SM4, 16-year Midwest swinging veteran Jeff Hubbard. Jeff specializes in targeting wild, weary fish in the relatively small, technical water of the Pere Marquette. These fish have given Jeff a lot to think about in terms of refining techniques and thinking outside the box. If you’re new to swinging—or have been stuck in a rut and want to take your game to the next level— consider these 5 tips toward an improved steelhead game. A lot of people get into swinging because they think it’s easy, a simple matter of throwing the fly out, letting it swing through a run and hoping something bites. “That’s incorrect,” Hubbard explains. “What you really need to learn to do—and this happens over time—is fish the fly.” The first step to doing this effectively is reading the water. When evaluating a run, you need to ask yourself two questions: 1) Where is an active fish likely to be holding? and 2) How can I get my fly down to the right depth to present it there for the maximum amount of time? The answer to the first question will depend on your river. The answer to the second will rely on time of year and current flow. But it’s going to involve being alert: watching your line and your tip and making adjustments through mending and repositioning for the duration of the cast. This is an extension of the above point. “Put simply, you’re not going to develop the confidence to swing flies, and swing them effectively, if you are constantly going back and forth between your nymph rod and your swing rod.” So leave that other stick at home, especially if you happen to be a legendary nymph angler before whom fish cower. It’ll force you to work harder and longer with your swing stick—and will make you a better angler faster. “Swinging flies allows you to fish a lot of water that guys can’t effectively fish while bottom bouncing or indicator rigging,” Jeff explains. 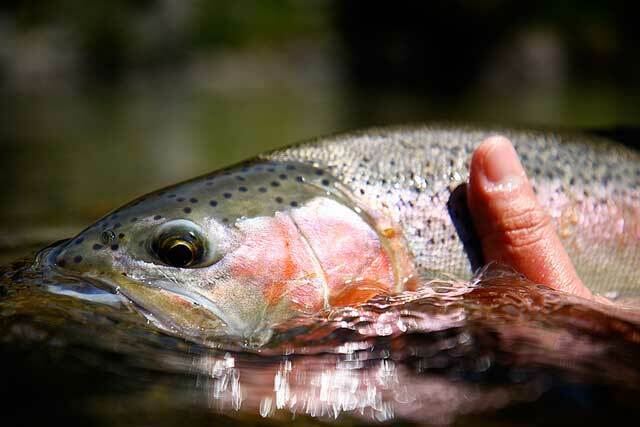 “Paying attention to that ‘swing-only’ water, especially on more heavily pressured systems, can really up your chances at fish.” What these spots look like is going to vary according to your river. It might be an undercut bank. It might be a run with submerged timber that would prove fatal to nymph. Or it might mean dangling your fly right in the face of a boulder pile or logjam. In any case, once you better understand what your limits are—and aren’t—you can begin taking advantage of lies that might not often get fished. “A lot of people fish too deep,” Jeff observes. “Especially when the water is in the upper 40 to upper 50 degree range.” Warm water makes for aggressive fish, and aggressive fish are more likely to suspend higher up in the column. They are also much more likely to look up than down, and a dredge presentation—which might be effective in February—might mean in this case that the fish simply aren’t seeing your fly. One way to remedy this is to start swinging higher up in the column, especially in early fall when the water temperatures are favorable, and then slowing your presentation down and moving it deeper if you don’t get any takes. There is, of course, no substitute for time on the water. But that doesn’t mean you can’t speed up the learning curve with a little dedication, a little patience, and a whole lot of paying attention. The two-handed semester is just about under way. Be sure you’re the one doing the schooling this year.